When I was a counselor at Camp Hanover, I genuinely loved the bedtime routine. Especially with the littler campers–the six and seven-year-olds. It started with vespers, a sunset time of prayer and song. Then we’d play a few last rounds of freeze tag or foursquare and head back toward our campsite. A typical camp group had six boys, six girls, a male counselor, and a female counselor. There was a girls’ cabin and a boys’ cabin. Each night before we parted ways, we sat in a circle together for “check-in” and talked about how our day went. Then, flashlights on, we’d walk in little lines to our respective cabins. Sometimes the girls had trouble winding down, so I’d light one of those glow ball candles popular in the 90s and turn the cabin lights out (camp counselor trick). We’d read a few bedtime stories and pray one more time. Nothing is sweeter than hearing young children pray from the heart. “My cat…The lady in the kitchen who makes our food…Me because I’m homesick…” Ah, it’s the sweetest. So, when I became a mom of two I had this vision of doing bedtime together, all at once, snuggled on one of the boys’ beds. The vision died for a little when I realized our boys were actually on two different schedules, with Hyatt (the younger one) petering out by 7:30 and Lincoln rallying until 8:30. Then sometime around November or December Bryce and I got up the nerve to combine the boys’ rooms. 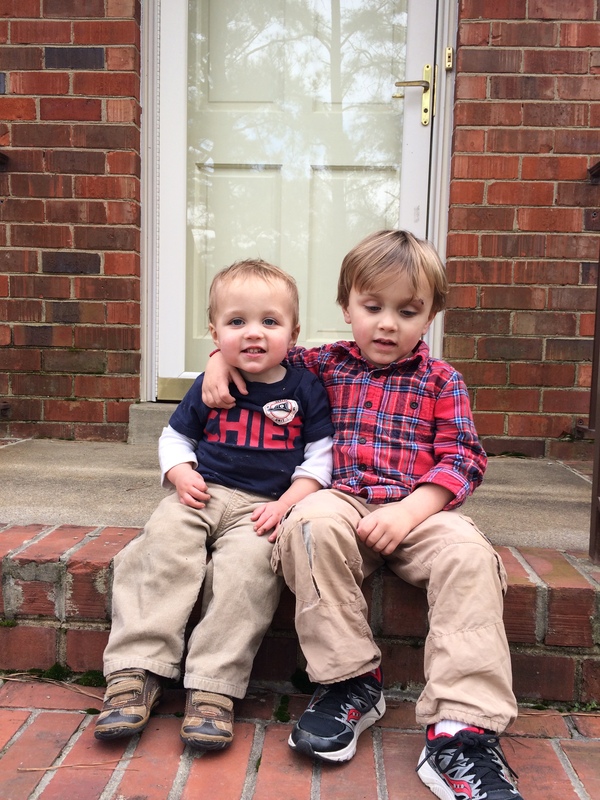 Hyatt was about 18 months and Lincoln was almost three-and-a-half. We didn’t know how it would go, and we definitely maintained a back-up plan, but it’s been neat to see the positive results and a slow merging of the bedtime routine. Here are some of the reasons our kids share a room. When half of the married couple snores like a…kitten purring…the other half has somewhere to go. White noise machine still required. If half of the married couple gets the flu and needs to be quarantined, we can make it happen. When friends or family visit, we can offer them their own room instead of the futon in the den (and the 6:00 a.m. visit from Lincoln asking for milk and cartoons). Extra storage! Having a spare bedroom means I can continue to hoard artwork, yearbooks, photo albums, trophies, and patches from soccer tournaments. Putting the boys in the same room did not go well at first. They were confused and seemed annoyed by each other. Sometimes Hyatt, a dramatic teether, would wake Lincoln up by crying in the middle of the night. Or Lincoln would wake up early in the morning, slam the bedroom door, and wake Hyatt up before he was ready. A lot of the time Hyatt seemed more lethargic and crankier than usual because he’d fall asleep around 7:30 p.m., wake up again when Lincoln came into the room, and then have trouble falling back asleep. Or, the boys would stay up late playing together and couldn’t figure out how to settle down. We almost moved them back into separate rooms, but decided to persevere. I’m glad we stuck with it because we’re finally seeing the fruit of their extra togetherness. They know how to play without us. After we tuck the boys in, they pop back up and start giggling and throwing stuffed animals back and forth. It’s pretty darn cute. They’re developing ways to communicate. In an effort to make it easier to play together, Lincoln gets Hyatt to say words–and even accommodates him by mimicking Hyatt’s gibberish and gestures. Hyatt has figured out how to point, grunt, and laugh to get Lincoln to do what he wants him to do. They can self-regulate. Eventually, they learned how to wind their playtime down without us having to intervene. 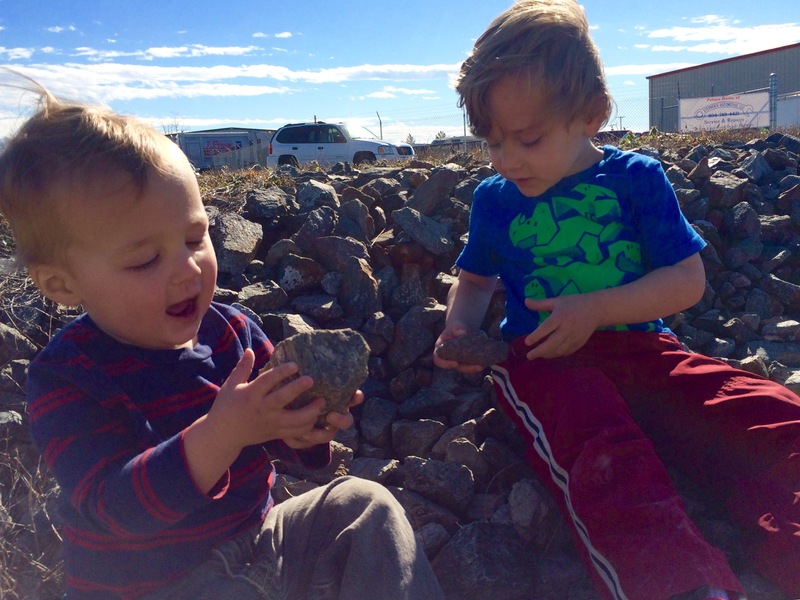 Every now and then we’ll hear a “Shhhh!” I’ve even seen this self-regulation translate into daytime play. 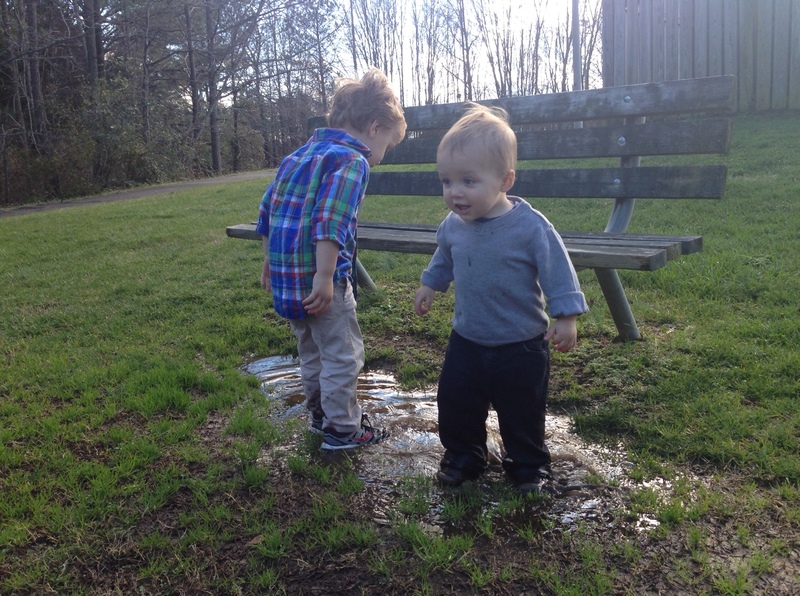 They take turns jumping in puddles and throwing rocks, like a well-oiled brother machine. Lincoln will be four in September, and his self-awareness and world-awareness is increasing. He doesn’t like to be alone right now. He says things like, “I just want somebody to stay with me.” and “Mama, I want you to come sit close to me.” He wants us to leave the door open for bedtime and for naps. All of this is endearing, frustrating, and will likely pass. Until it does, we can remind Lincoln he has his little brother with him who loves him. 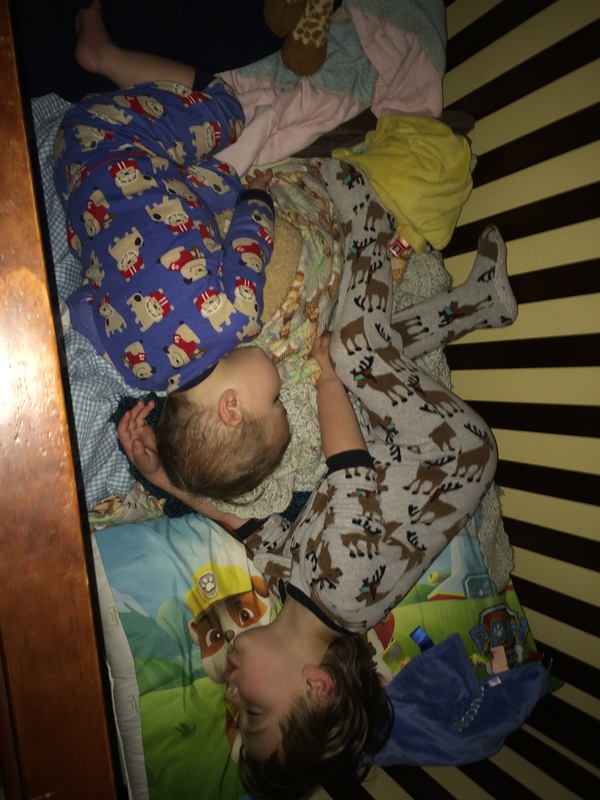 Sometimes Lincoln climbs into Hyatt’s crib and tries to sleep with him. Hyatt usually gets mad and cries until we get Lincoln back into his own bed, but occasionally he concedes. The longer we’ve gone this combined-room route, the easier bedtime has gotten. Sort of. We still have a one-year-old and a three-year-old, and they’re still energetic boys, and we’re always tired and all of that, but we’ve kind of gotten to the point we can do pajamas, teeth, books, and prayers all at the same time. Most of the time. If Lincoln isn’t tired yet, he knows he can still play with Hyatt. Both of them know they still have time for a little more fun, which alleviates some of the frustration, discipline, and negotiation required to get them settled in. Tonight I put Hyatt in his crib and Lincoln in his bed, and they seemed to want to socialize with me a little longer. They were actually still paying attention to me. So, we took a moment and talked about Easter–how Jesus rose from the grave and brought us into relationship with God. Big concepts, right? Lincoln agreed with what I was saying in his sweet, compliant, affable way, and Hyatt listened with his eyes (probably plotting something). While I need a lot more practice talking with my kids about most things–especially the big important things–I’m getting closer to that vision of bedtime as the rich time, the time where we check in with each other and bond as a unit.